Wow, this purple coin is so my thing, I love it!! 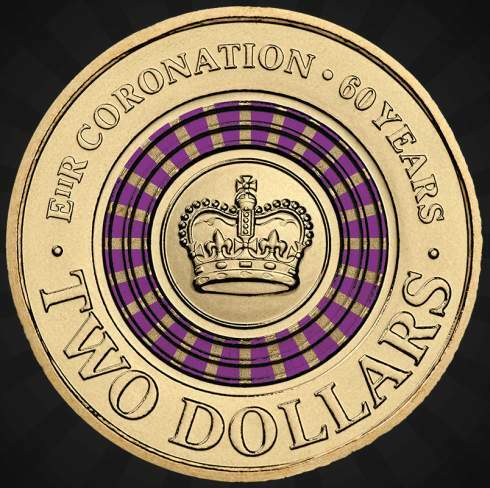 And 2 million is a pretty low mintage for circulation, it might be pretty hard to get a hold of one of these. know the $$ mint shop price PP? The C mintmark coin is available in the Mint shop for $12.95. For the circulation no mintmark type we might have to wait. The mint website appears to be a bit slow today, on my internet connection anyway. Must be all that purple coin chasing activity. edit: good one Robbie, added link here. 5??? Strange. That article is typically news though as it implies a lack of excitement because it's the second coloured coin in circulation. It is though the first, it's all in the wording of availability/press releases. I wonder where the author got his/her information from. This excerpt makes it appear as though there might be a non-coloured (standard) version, but I doubt that it’s correct. Good eyes Nancy, I don't think from what I've read that's correct either. (18-06-2013, 08:08 AM)Nevol Wrote: ...makes it appear as though there might be a non-coloured (standard) version, but I doubt that it’s correct. Heh, give it a month or three, and it will be. I'm not seeing any flashy purple in that drum!!??! !